Children who are challenged by disability and extreme poverty face the greatest danger of being deprived of their right to education and freedom of expression. For this population, technology must not only be accessible; it must also fit within a context of severe limitations in infrastructure and income. The right solution will address the presence of numerous languages within the same region and will empower local people, disabled or otherwise, to contribute to their own knowledge and culture repository. Technology that relies on access to grid electricity will not serve the poorest 1.5 billion people. Sadly, this barrier isn’t likely to be removed soon – the International Energy Agency predicts 1.3 billion people will remain without electricity for the next 20 years. Alternative energy options are ideal, but one should proceed with caution, as the practical amortized cost will often exceed what is possible for consumer-sustained revenues or even for government education budgets. When an education ministry has USD 100 a year per student to split between teacher pay, books, furniture, and construction of running water and toilets, little remains for new educational technologies. Program designers need to thoroughly measure and disclose the total cost of ownership of any solution, particularly technology based solutions. Mobile-based technologies have greatly impacted development; but there are three important costs to consider: 1) the cost of the handset, 2) the cost of network access, and 3) the cost of energy consumption. Smart phones have potential as education devices, but their cost is out of reach of the poorest two billion. Even basic phones may still stretch available financial resources; and if the educational value requires the mobile network, the cost of network time and even the availability of the network may reduce the feasibility. Finally, use of mobile handsets as everyday learning tools requires constant recharging, which adds cost and additional logistics. No matter how well a technology adapts to resource constraints, it has little use without good content. Good content includes a “killer app” that supports a school system’s goals (including their existing curriculum, exam requirements, and methods of teaching); but content can also mean stories, information, or knowledge that has direct practical and even entertainment value. Even if this content isn’t directly useful to schools, it may be invaluable to education. A successful technology solution will be built from the ground up to support content. But where does the content come from? The Web will not easily reach the poorest 1.5 billion people who lack electricity. But suppose we could magically make the Web actually accessible “World Wide”– what content would be helpful? Serving the needs of disabled children in the poorest regions of the world requires content in thousands of languages. A look at Wikipedia’s article count by language demonstrates the problem. English speakers can find millions of Wikipedia articles, but very few children understand English. Meanwhile, the 8 million Twi speakers of Ghana are served by 65 articles. What if we had a massive effort to translate English content on the Web to thousands of other languages? Would the problems, questions, and interests of children in remote rural areas be satisfied by the content on today’s Web? The solution to this problem (already learned with the Web) is to ensure technology is serving content production as much as consumption, and further, to turn consumers into producers. Examples of producers include district government agriculture experts, local nurses, concerned mothers, and disabled children with something to say (all of them). To connect content producers with consumers, we need distribution. This presents another requirement for technology projects: affordable digital distribution. Mobile communication networks should be leveraged when available and affordable (which varies drastically across impoverished regions of the world), but the greatest scalability will be achieved using additional means of distribution, especially at the local levels. Content producers are the key. Technology can provide the tools. But none of this is possible without collaboration among technology developers, development practitioners, funding organizations, governments, and content producers. No single NGO program can do this work, and no single product will provide a comprehensive tool. Literacy Bridge, the organization I founded in 2007 to work on these problems, set out to design a rural audio computer based on the above principles. 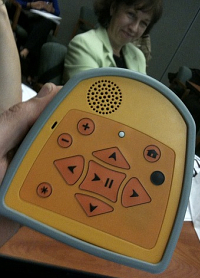 The device is designed for access to audio knowledge. At high volumes, it can be produced for less then USD 10. It can be powered by locally available batteries. It interactively quizzes students and provides them feedback. It allows anyone to make a recording and share any audio recording with others using device-to-device copying. Literacy Bridge is also now working to allow audio recordings to be uploaded and downloaded to the Web using basic mobile phones and voice networks. After a year of field observations and a growing dataset of results, we are more convinced than ever that this is the right approach towards improved access to education for all. We see our technology and our programs as a couple pieces in the puzzle; and, we continue to search for partners with other pieces and who are dedicated towards solving this puzzle. Written by Cliff Schmidt on February 25, 2010 in Assistive Technology. Great article, great thoughts and arguments. Thank you. I also believe that mobile, affordability, audio and local content are important keywords. I hope that more languages will be supported by speech synthesis solutions (text-to-speech) in the future. This would allow people who cannot read to access digital content in their local language as well. I hope that more languages will be supported by speech synthesis solutions (text-to-speech) in the future. This would allow people who cannot read to access digital content in their local language as well.